I’ll have a go at Deganwy on the Llandudno branch but there isn’t a footbridge where there should be one! About 1900, parcels look like newspaper packages. Presence of centre lamp socket and coal rails suggest a later date - around 1910? An excellent picture, not seen before. Cannot place it though. There is a centre lamp socket on the bufferbeam, making the earliest possible date 1903. There is also something in the top lamp socket, but I can’t make out what it is. The location? Sorry - have not a clue! The loco also has only one whistle on the cab roof, so again post 1903. If it were Deganwy wouldn’t there be sea behind the fence on the left? They look like chimney pots. The clothes suggest 1905 to 1910. There is an advert which I think reads “Finnigans of Deansgate” which would place it in the Manchester area. It appears to be a high level station and boasts a bay platform. I have no idea where it might be. I seem to recall that the LMS distributed internal mail such as posters and timetable notices by the train guards leaving them on the platform at intermediate stops. Is that what the parcels are? Perhaps the LMS inherited the practice from the LNW. I believe the station is Newton-le-Willows, Lancs. The view is taken facing west. i.e. towards Liverpool. There would have been a bay platform to the right of the photographer. The rooflines and chimneys of the buildings compare with those at photo no. 133 in “Railways around Lancashire” (Manchester Transport Museum Society 1975). The train in the bay could well be a stopper to either Bolton Great Moor Street or Tyldesley. 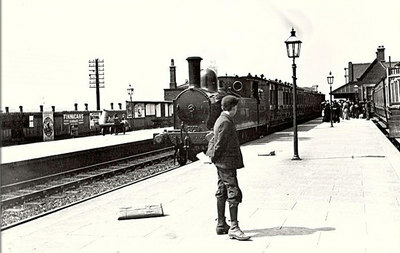 The train on the through platform would be destined for Manchester (Exchange). I was unaware that a bay platform ever existed, can anyone confirm this? The station is certainly Newton-le-Willows and the train is facing towards Manchester NOT Liverpool. There was a bay here as evidenced by the coaches on the right, just behind them was the well known McCorquodales printing factory which for many years printed railway timetables, weekly notices etc right up to closure in the 1980’s. I worked at a sister comapny on the same sight and used to go over and get copies of the weekly traffic notices! It’s definitely Newton-le-Willows. I wasn’t sure about the bay, at first, then remembered that used to park my car nose in to the platform face in the late 1970’s. A link to a view of Newton le Willows station.The building looks pretty much like the one in the mystery photo, and the area where the bay would have been is off to the left. As I submitted the photo originally, and people seemed to have guessed Newton le Willows, confirming what I was pretty sure of. The dates too are around the same as I had guessed, c1910. The parcels, I had no idea about, so the info regards to their contents is useful. Maps of 1893 and 1928 show a bay, and sidings into McCorquodales printing works. Re: Mike Williams “There is also something in the top lamp socket, but I can’t make out what it is.” Having looked at the photo in detail, I believe it is just light reflecting around the curve of the chimney base. Thanks to everyone for their informed detective work on this photo, and indeed all the Mystery Photo’s. Having travelled on this line for over 40 years I can definitely state that this is Newton le Willows Station. The objects on the platforms do not seem to be ordinary parcels for the public but railway company items dropped off on the platform by the Guards of previous trains, presumably information for the Printers. The Booking Office is at present down the stairs at ground level and maybe at that time also the Porters rooms and maybe it was inconvienent to meet each train to collect items to be left by the train Guards and would be collected at the staff's leisure. At a guess I would say it is the original Wigan North Western Station with the bay platform being what is now platform 3. Beyond any doubt, this is Newton-le-Willows looking west. In An Historical Survey of Selected LMS Stations Volume 2, by Dr R Preston Hendry and R Powell Hendry (OPC, 1986) there's a photograph - undated but c1980 - taken from a similar position. Plans in the book show two tracks in the bay in existence in 1916 and 1960. The building on the south platform was demolished in 1987, but the main building was still there in 2001 - at the time of the LNWRS AGM at Rainhill. That is most definitely Newton-le-Willows and I used both of those trains and their successors on hundreds of occasions. I now live a bit nearer to Earlestown station, which is situated in... erm, the town centre of Newton-le-Willows! I still use N-le-W station once or twice per month to travel by the Liverpool to Manchester Airport trains. These do not stop at Earlestown, except on Sundays when every train stops there.